A subject of fascination for thousands of years, magnets are an essential part of modern electronic devices such as computers, microphones, electric motors and cars. 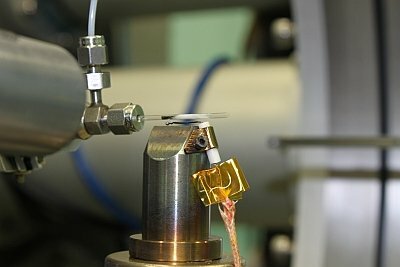 Australian researchers are using synchrotron techniques to understand the formation of the key magnetic phase in a new generation of magnets with improved cost effectiveness. The strongest permanent magnets currently known are made from iron, boron and rare earth elements. The world market for permanent magnets is worth around US$11 billion, with neodymium- iron-boron (Nd2Fe14B) magnets accounting for 62 per cent of this total. Permanent magnets are typically made from ‘hard’ magnetic materials, which have a high resistance to becoming demagnetised; ‘soft’ magnets have much lower resistance to becoming demagnetised. These characteristics are measured in terms of properties called coercivity (resistance to demagnetisation) and remanence (ability to retain magnetisation). Caption: Researchers are using powder diffraction to find out how heat influences the properties of a new generation of strong permanent magnets. A three-centimetre-long glass capillary contains an amorphous precursor that is gradually transformed into a magnetic material when heat is applied. PhD student Vanalysa Ly and her Monash University supervisors Christopher Hutchinson and Kiyonori Suzuki are developing computer models of crucial stages in the production of nanocomposite Fe-Nd-B magnets. These magnets consist of a magnetically-hard Nd2Fe14B phase and a neodymium-free soft phase, significantly reducing the total amount of costly Nd. They are produced by applying heat to transform an amorphous precursor (a ‘melt-spun’ Fe77.5B18Nd4.5 metal alloy ribbon created by rapidly cooling a molten stream of the metal) into a crystalline material with the optimum arrangement of phases. The challenge is to select the right precursor from an infinite range of compositions and then subject it to a suitable heat treatment. Vanalysa used the powder diffraction beamline at the Australian Synchrotron in February 2011 to examine the in situ crystallisation at varying temperatures of a series of amorphous precursors for nanocomposite Fe-Nd-B materials. Vanalysa acquired a continuous series of five-second ‘snapshots’ of her materials over the course of the heat treatment in order to obtain time-resolved measurements of the different phases as they formed and disappeared. The beamline setup enabled her to capture both the thermodynamic and kinetic aspects of the crystallisation of the amorphous melt-spun ribbon as heat was applied. Vanalysa’s powder diffraction results will help her to modify and validate a phenomenological phase transformation model she has developed to quantitatively capture the nucleation and growth of competing phases as a function of alloy composition and thermal treatment. The next step will be to perform desktop experiments that simulate heat treatments with the aim of identifying promising heat treatment schedules that could potentially enhance the magnetic properties of the resulting material.